BEATA CHRZANOWSKA's works encompass what a tender dance between color and form would look like. Highly realistic yet minimal, her painted figures naturally coexist among sharp spontaneous geometry. She paints with feeling to create an intense, desirable, and euphoric mood. The femme, her primary subject, dominates and inspires her work. The body becomes a series of shapes that come together as an intricate puzzle that requires an audience to put in place. The work deconstructs the beautiful and recomposes it with a new armor that resonates an indestructible landscape. Beata Chrzanowska, (b. 1987) Polish born artist, grew up in Chicago. She received her education studying the human form from the Milwaukee Institute of Art & Design in Wisconsin. Her work was recently presented at Select Fair (Miami, FL) with Brooklyn based BACG. Cheryl Hazan (New York, NY), Sensei Gallery (New York, NY), Arthelix (Brooklyn, NY), City Bird Gallery (New York, NY), Gallery Bar (New York, NY), C.C.C.P Gallery (Brooklyn, NY) are among the spaces she has shown her work. 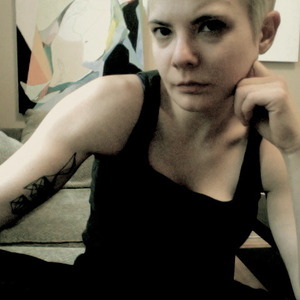 She has also been featured in HiFructose Magazine, Nakid Magazine, Wild Magazine, UNDR RPBLC, and Posture Magazine. Her mural work can be seen both in Milwaukee, WI and New York, NY. She continues an active career in the arts painting and drawing from her studio in New York, Queens.